A decorated member of our military is under fire for questioning local school officials about a school uniform policy. The popular military blogger and internet radio host believes he’s being singled out because he questioned the Obama Administration as well. Master Sgt. C.J. 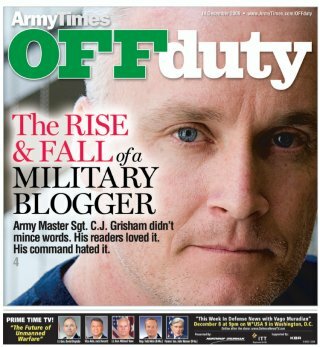 Grisham, a 15-year Army veteran and military blogger who was invited by President George W. Bush to the White House for a historic sit-down meeting with a select gathering of “mil-bloggers”, is the cover story on ‘Off Duty’, an insert included in the Military Times, the magazine for the Army, Air Force, Navy, and Marine Corps. Read about Grisham’s plight at World Net Daily.